She gets up early, pushes through a driving rainstorm to the mammoth red-brick art studio building at the base of College Hill, and opens the oven door. She finds three finished pieces…and four piles of powder and shards. 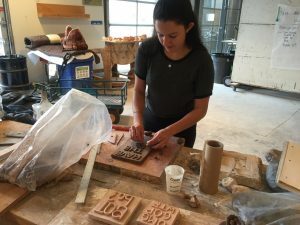 It is what her teacher, Nestor Gil, assistant professor of art, calls “a learning experience.” To make each of the delicate pieces Pastron is planning, the California art major has to be sure to roll out all the tiny pockets of air from the clay. If she doesn’t—BOOM. Pottery potato chips. She lays all the broken pieces on a table. A passing professor proclaims them “cool.” Gil assures her they’ll find a use for the shards. “Artists are great,” says Pastron. Her voice is hoarse—too much hollering during the Homecoming football game this past Saturday. 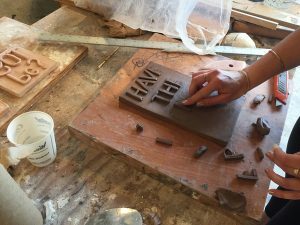 By 9:30 she’s back molding wet clay into messages. She plans to hang the pieces in various spots around campus just to see what happens. “It might be frowned upon,” she says. She is curious to see if—no, she’s hoping someone takes them. Maybe they’ll be thrown away because of their message. Maybe they’ll wind up in someone’s personal collection.